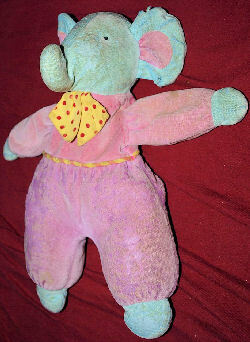 We are desperately looking for a blue 90’a Eden elephant wearing a pink sleeper with a large bright yellow bow with big red polka dots. The size is approximately 10 inches, it is soft and flexible, and there is no rattle or anything else contained in it. I have searched and searched for this Eden toy elephant who has been hugely significant in my eldest son’s life. I gave him to my son when he was teething and in huge pain, and it settled him. There was an incident where we lost Humpy in a town, and a kind person put him on a window sill, so we got him back! This was just so fortunate, as my son would have been distraught. As a family we have been devastated by the news that my husband has a rare Young Onset Frontotemporal Dementia and has had to retire from a senior medical post. It has been very hard on all of us, but especially for my son, who has left to go to University. Humpy is now threadbare and has been re-stuffed and repaired by my mother, but still, at 19, my son sleeps with him when he comes back as a huge source of comfort. I have searched for a replacement one for him for so many years, and when I saw this site I had new hope I might find him. Of course it will never really be a replacement, but I can’t help thinking there must be one somewhere??? I just wanted to say thank you for posting this! Although I did not find your elephant when I searched, I did discover the brand of an elephant and teddy bear I myself own. I’ve been looking for the brand on them for a really long time, since the bear is quite worn and very dear to my heart. She’s definitely an Eden! Now I can get another one to cuddle!! Maybe it was fate I found her through this post. Thank you! !